The Virginia Funeral Sales Association consists of member firms that specialize in products and services specifically for the funeral home industry. As a partner of the Virginia Funeral Directors Association, our members are dedicated to supporting local funeral homes in Virginia. If your funeral home is looking for a preferred supplier, please see our membership list. You will find just about every supplier you need and can trust. VFSA is now on Facebook! Or email us at info@vfsa.net. 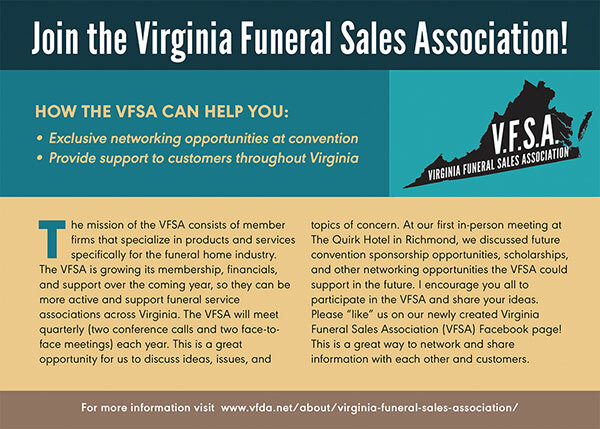 Virginia Funeral Sales Association (VFSA) Membership shall consist of owners and/or representatives of a business organization, whether individual, partnership or corporation, providing funeral home, cemetery and crematory related merchandise, supplies or business services to the funeral profession. This member may attend any open meetings of the Association, including conventions and education sessions, but shall not be entitled to vote or hold office, except for the VFSA Representative serving on the VFDA Board of Directors.